Preventing and Countering Violent Extremism has become a global challenge and gained a prominent place in the multilateral Agenda. 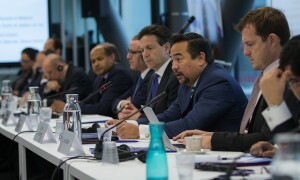 To inform ongoing discussions on this global issue, the Permanent Mission of the Kingdom of Morocco, the Permanent Mission of the United States of America and the Geneva Centre on Security Policy (GCSP) co-organised a Policy Dialogue on 3 December 2015, where States that have developed national strategies on CVE and other stakeholders shared their respective experiences. Best practices of CVE that have emerged at the local, national and regional levels were shared so as to allow countries that are willing to step up their national efforts in this field to gain from existing and available experiences. This exchange came at a time where both the UN Security Council and the UN Human Rights Council had been taking up this issue through important resolutions adopted in 2014 and 2015. This meeting addressed the importance of understanding the concept and practice of CVE. The issue of CVE has suffered some lack of clarity and understanding with both policymakers and practitioners as the terms “CVE” and “counterterrorism” have been used interchangeably while they refer to different concepts and approaches. Preventing and Countering Violent Extremism is a whole-of-society effort that requires an integrated approach that seeks to address the security, religious, social and human rights dimensions. Against this backdrop, the Conference brought together diplomats, academics and think tanks in order to exchange views, and address comprehensively CVE at a time where the UN Secretary General and specialized agencies are developing multi-stakeholder plans to address this global challenge.